Little Robot, by Ben Hatke (First Second, Sept. 2015), is a lovely graphic novel for the young (1st or 2nd grade) reader, that can, like all of Ben Hatke's books, be enjoyed by older readers too. A little girl, still in her white nightie, climbs out her bedroom window. She's too little to be one of the kids getting on the school bus, so she heads out to explore. In the junkyard she finds a tool belt, which she dons, and her lonely path takes her on to the edge of a stream. There, in a cardboard box in the water, she finds a robot! Now she has a companion, and she and the little robot explore nature together. But the Big Factory of Robots has noticed little Robot is gone, and a scary bot is sent out to find and retrieve him. And the little robot himself isn't sure about his own situation; he misses the company of others like himself. When the scary bot seizes little Robot and takes him back to the factory, the girl follows....and with tons of gumption, she saves her friend. The nearly wordless story is an utterly charming story of ingenuity, friendship, and pluck! 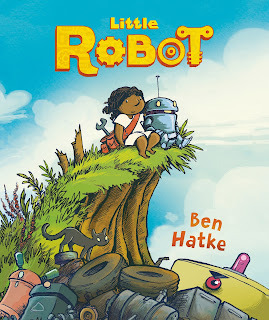 I love Ben Hatke's art--his characters, whether robot or girl, all have such endearing personalities (unless they are scary hunter robots! ), and this story is a particularly satisfying one for any kid who wants a best friend. The little girl is also a great role model for anyone who's wanted to be a maker and a tinkerer with tools! Her skills with a wrench and her confidence in her abilities are what makes the happy ending as happy as it is. It's a good book to give emergent readers, to give them the habit of turning pages and becoming immersed in a story, without the possible stress having to read words might bring! What makes this book stand out (apart from the great pictures, great story, and appealing protagonists) is that the little girl is not only a kid of color, but she's from a family that isn't economically advantaged--she lives in a mobile home park, and the grown-ups in her life aren't helicopter parents lavishing her with round-the-clock attention and material possessions. (The only thing that negatively impacted my enjoyment of the story was my very deep maternal concern that the little girl was going to end up with tetanus from wandering around the junkyard in bare feet, although I realize that the target audience won't share this anxiety). But in any event, it's lovely to see the possibilities of fantasy adventure expanded to include kids like her! Here's the starred Kirkus review. disclaimer: signed copy received at Book Expo America, but I was so excited to be meeting Ben Hatke and Gina Gagliano from First Second that I became overcome, and like a derp I left my signed copy behind at the signing desk. Gina was kind enough to mail it on to me. Thank you so much, Gina! I love Ben Hatke's artwork, too. And I love, love, LOVE that this little intrepid is brown - not that it makes any difference to her story or her actions, but it's so nice to be included. I am sooooo jealous! You have a signed copy and have met Ben Hatke. I am sure I would have gone all derp too. I can meet authors that write for adults and musicians and other famous people without turning into an idiot, but childrens authors that I love still have the power to make me feel about 5 years old and giggly. What a wonderful review! If you're interested, we'd love for you to link up this post (or another featuring diverse kid lit) with the Diverse Children's Books Link-up! You can find it at http://pagesandmargins.wordpress.com/2016/04/16/diverse-childrens-books-link-up/. Thanks!